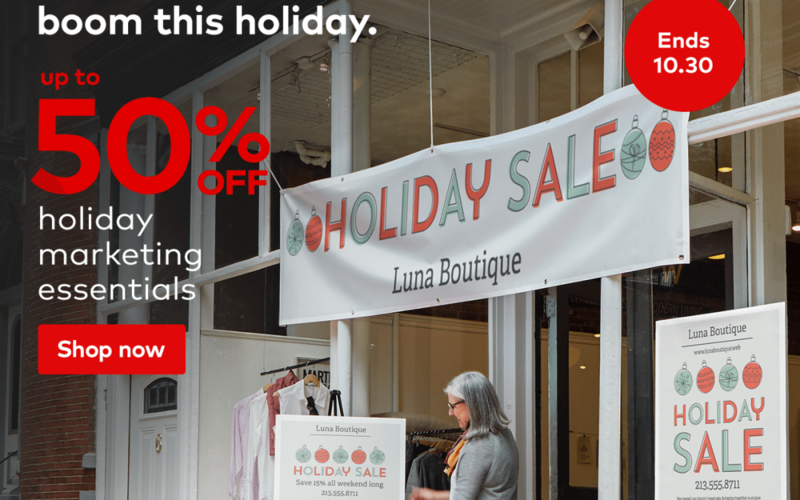 Up to 50% off vistaprint marketing products! Take advantage of up to 50% vistaprint marketing essentials for your business! Everything from Banners and posters to business cards and flyers. Like a poster but sturdier. Ideal for promoting special events or sales. Whether you hang up, hand out or mail them, postcards get the word out. Promo code BIZSAVE expires Sunday, October 30, 2016 at 11:59pm (PT). Limit one promo code per order. Savings will be reflected in your shopping cart. Discounts may vary by quantity and design and can’t be applied to shipping and processing, taxes, subscription or design services, previous purchases or products on the Vistaprint Promotional Products site, unless otherwise specified. Additional fees may apply for shipping and processing, and taxes, unless otherwise noted. Free offers valid only on the lowest quantity of each product and not valid on more than two items per order. Maximum savings apply for some offers.